1) Heat oil in a pan then add half of the sliced onions and fry until they become light golden brown. 2) Add ginger garlic paste, pureed tomatoes, cumin seeds, black pepper corn, cloves, salt, red chili powder and fry for further 5 mins or until oil leaves the masla. 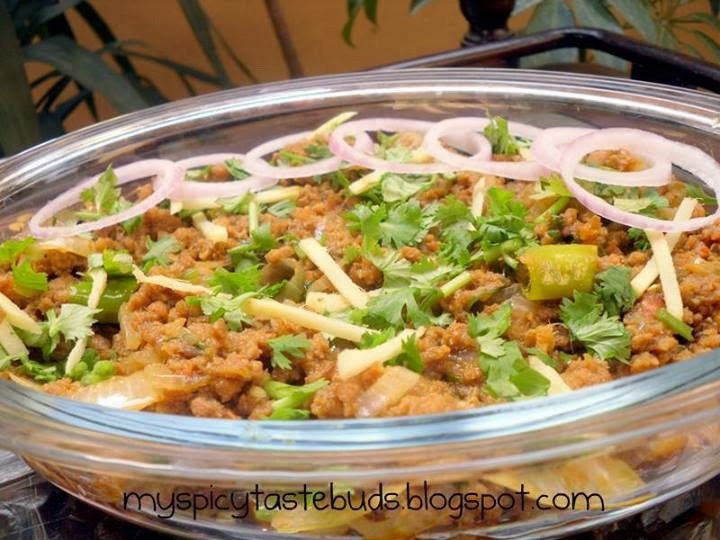 3) Now add in the Qeema (minced meat) and fry it well, make sure no lumps remain. Once the qeema changes color add I cup of yogurt and half a cup of water, cover the lid and let it cook on low flame for 30 minutes. 4) After 30 minutes take the lide off, sprinkle garam masla , dhania powder and add the remaining onion slices (you can also cut onion in to rings) along with chopped green chilies and fresh coriander, give it a stir cover the pan and let it cook on low flame for 5-10 minutes and turn the flame off. 5) Put the coal over medium flame, wait until the coal is fully red and is covered by white ash. Put a small piece of aluminum foil in middle of the qeema. Place the burned coal over it and put 2-3 drops of oil on it. Cover it at once with a tight fitting lid and put aside for 5 minutes. 6) Remove the coal and serve with roti/naan. Remove the coal, transfer the qeema to a serving dish and decorate with onion ring, green chili and coriander leaves. Serve hot with Roti or Nan.